Freshly pressed: a paper by Francisco Cádiz and co-authors describing how they used land snails to decipher the origin and isolation in forest relicts in northern Chile. The abstract reads: “Among the questions surrounding the biogeographical history of the Chilean biota, none has gathered more interest than the origin of the Fray Jorge (FJ) for- est relict and its biota. Inserted in a semi‐desert area, this forest enclave exists due to the existence of a very particular microclimate in this region. The age of the disjunction and the historical relationship between the FJ biota with the remaining components of South America are explained by two distinct, competing hypotheses: the first suggests that it would have become isolated during the climatic changes of the Paleogene/Neogene, while the second suggests that the isolation is a product of Quaternary glaciations. To discriminate between these competing hypotheses, we used DNA sequence phylogeny methods and molecular genetic dating to the study of a genus of land snails (Plectostylus) that occurs in the FJ relict and throughout Chile. The phylogeny shows a clear distinction between forest and arid clades, and each of these clades is formed by many geographically circumscribed populations. 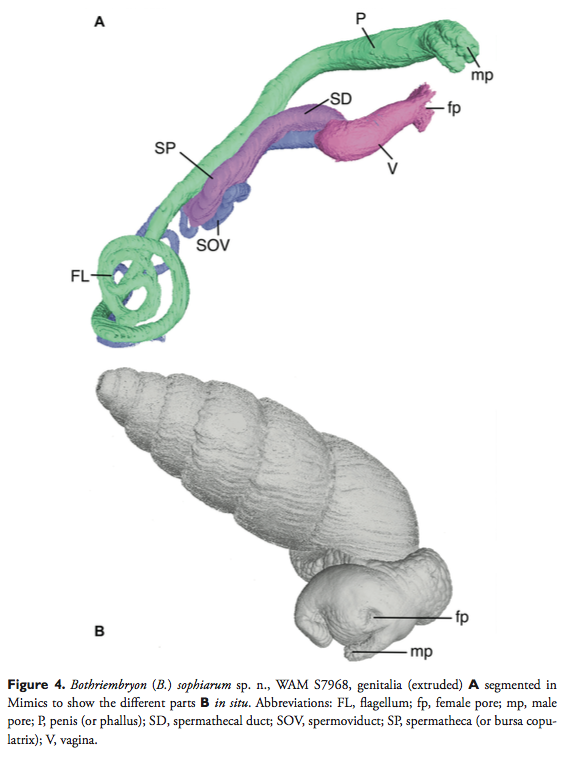 The FJ fragment snails form a clade that is sister to all other forest clades. The separation between the Fray Jorge clade and the other forest clades dates back to the Paleogene/Neogene. Our data suggest that the FJ forest is a relict from the forests that occupied that landscape during the Paleogene/Neogene and retreated due to the aridification of the region. We also observe that the current taxonomy of the Plectostylus genus must be re‐evaluated”. An interesting paper that uses molecular data of an endemic land snail group to sort out competing hypotheses of ancient landscape genesis. More often, ecological data are used to support a hypothesis of the taxonomy of species; this time it is the other way around. While working on this study the authors also collected data on the taxonomy of this group, but this will be dealt with in a future paper. Cádiz, F.J. et al., 2018. Phylogeography of Plectostylus Beck, 1837 (Gastropoda, Stylommatophora: Orthalicoidea): Origin and isolation of the Fray Jorge forest relicts in northern Chile. – Journal of Zoological Systematics and Evolutionary Research, doi: 10.1111/jzs.12241 (10 pp.) (advance publication). This entry was posted in Uncategorized and tagged Bothriembryontidae, chile, ecology, literature, phylogeography, plectostylus on July 31, 2018 by bramb. 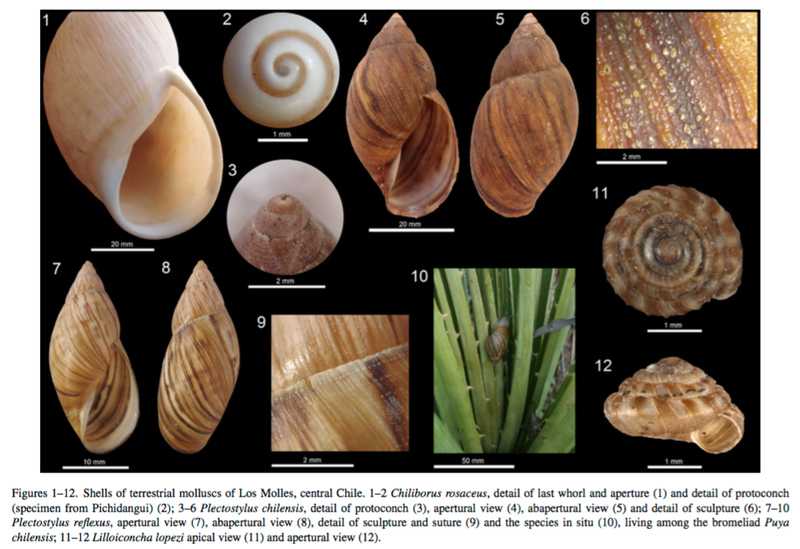 The abstract of the new paper by Araya (2016) reads: “Among the terrestrial invertebrates, the molluscan species of central and northern Chile have been scarcely studied and here, for the first time, a record of the diversity of land snail species of Los Molles (32◦14′ S, 71◦31′ W), in the Valparaíso region, central Chile is reported. Four species were found: Chiliborus rosaceus (King & Broderip, 1831); Lilloiconcha lopezi Araya & Aliaga, 2015; Plectostylus chilensis (Lesson, 1830), and Plectostylus reflexus (Pfeiffer, 1842); all of them are ground dwelling snails, endemic, occurring in small geographical ranges or in fragmented populations along northern and central Chile; L. lopezi is an endemic species to Los Molles. The geographic distribution records of P. chilensis and P. reflexus are also extended and illustrations of the species and distribution records are presented. The areas around Los Molles harbor a comparatively high diversity of plants and invertebrates, and they should be considered in future conservation efforts”. Araya, J.F., 2016. On some land snails (Mollusca: Gastropoda) of Los Molles, central Chile. – Revista Mexicana de Biodiversidad, 87:1365–1368. This entry was posted in Uncategorized and tagged Bothriembryontidae, charopidae, chile, literature, strophocheilidae on December 27, 2016 by bramb. A paper with a description of one new species is nothing to be taken too serious, but we are proud to present a novel way of (non-)dissection to study the genitalia: applying micro-CT and reconstruction with dedicated software. As far as we know this is one of the first times this method is applied to (land) molluscs in the context of describing a new species. Although the results presented here are satisfying, it is not necessarily a quick method and it is also quite laborious. However, in the case of a single or just a few specimens, this may be an alternative for destructive dissection. In this paper we show it as a ‘proof of principle’ for the application of this method. Whisson, C.S. & A.S.H. Breure, 2016. 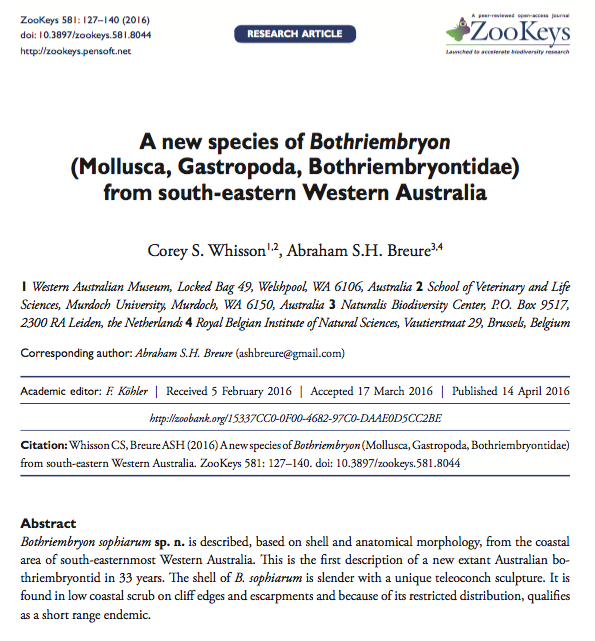 A new species of Bothriembryon (Mollusca, Gastropoda, Bothriembryontidae) from south-easternmost Western Australia. — ZooKeys 581: 127–140. This entry was posted in Uncategorized and tagged Bothriembryontidae, ecology, micro-CT, publications, taxonomy, types on April 14, 2016 by bramb. Leap Days are relatively rare events, and a paper which appears on a Leap Day is even rarer. However, this year’s Leap Day saw the birth of a new subfamily: Prestonellinae. The name was originally coined by van Bruggen nearly 40 years ago for a family, but introduced in a way it was not available according to the ICZN rules. Moreover, during these years additional research has shed more light on the systematic position of this group. And thus any day is a good day to make it available under the Code. It happened just to be 29 February 2016. This entry was posted in Uncategorized and tagged Bothriembryontidae, publications, taxonomy on March 2, 2016 by bramb.